Many of Whistler’s top restaurants offer fixed-price special menus and deals for the autumn season. Check out the ads in Pique Newsmagazine when you get to town for details, or call your favourite restaurants in advance. To get your appetite going check this list of local establishments and don’t forget the Whistler Farmers Market runs every Sunday until October 11, 2015. 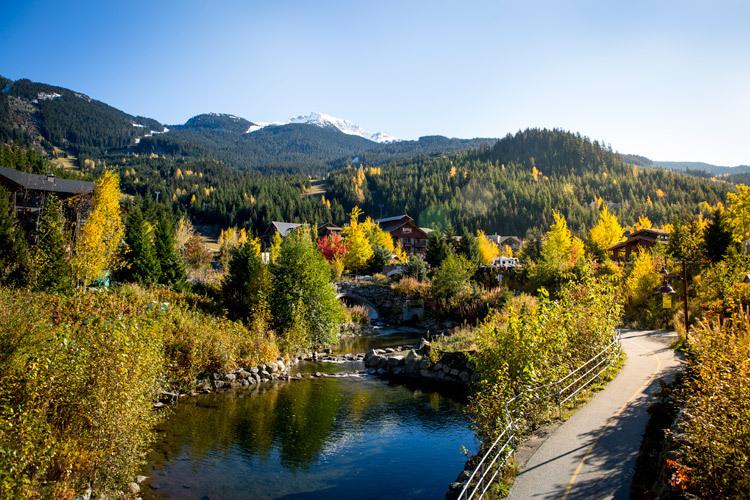 Believe it or not, we are used to all kinds of weather here in the mountains and most of Whistler’s epic summer activities keep going into autumn– sightseeing on the mountains and downhilling in the bike park continue through to October 12, 2015. ATV, Side X Side or 4×4 Backcountry adventure tours, ziplining and most other recreational activities keep right on rolling. Once you arrive the Whistler Visitor Centre in the Village has the most up-to-date information on what’s happening and what tours are running where. Autumn rains or cooler temperatures are no big deal if your hotel has a heated pool and hot tub especially if you are taking advantage of off-season deals and rates. Everyone likes to save a bit of money and autumn is a good time to do it. Life in the mountains is all about being able to thrive in all sorts of weather. Rainy day? Get out there and and get muddy on hundreds of kilometres of bike trails, take an adventure tour, or head out fishing. Shopping is always an option, or touring our local art galleries or museums. You can take an art class through the Whistler Arts Council, zen out with some floatation therapy or do it up nice at one of Whistler’s spas. Sun is shining? Autumn is an excellent time to hike to the high alpine and enjoy the fresh air, changing colors and fall mushrooms. Or make one last lap of your favourite biking or running trails around town. Or maybe you’d just like to fit in one last patio tanning session. Whistler golf courses are open through Canadian Thanksgiving weekend (October 10-12, 2015), and the courses in Pemberton will usually operate even later than that. This is exactly what it sounds like. Runners start at the Salomon Store in Whistler Village, and make their way up to the Peak. The last section follows the spectacular High Note Trail. The total distance is 23km, with a lung-busting elevation gain of over 1,600 meters! Check out these free shows featuring the Great Lake Swimmers (September 5) and Spirit of the West (September 6) at Whistler Olympic Plaza and classic Canadian rockers Trooper are lighting up the stage on September 12. Enjoy the annual celebration of Mother Nature’s autumn bounty up in some of Whistler’s most pristine backcountry. 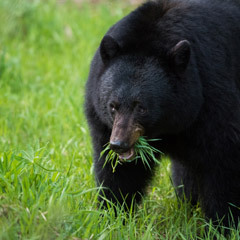 It’s a 4.5 km hike into Journeyman Lodge but once you get there celebrations include free pancakes, a pie topper contest and nature tours and lectures on the roles forest foods play in our culture, history and heritage. This is one of the most fun under-the-radar fests of the year. Hikers depart at 8:00AM from the Callaghan Lake Trailhead. More details. It’s hard to argue with beer so this fest gets bigger and better every year. Over 70 breweries are taking part for 2015, the fest now runs over four days and includes seminars, cask nights and industry events. More info. You come across a lot of crazy on an average day in Whistler, but the sight of eight longboard skateboarders in full tuck, barreling down and around the steep, curvy road of the Whistler Sliding Centre, never fails to drop jaws. There’s no charge for admission, and there’s a beer garden at the bottom of the course. More info. For all those racers who aren’t opposed to pedaling uphill before racing down, and who aren’t ready to hang up the bikes just yet. Mudderella is a women only obstacle course challenge, taking place on Blackcomb Mountain. Work together with friends, scale walls, crawl through mud and freezing water, skip across logs, and more. Sounds fun right? More info. This is the 30th anniversary of this spectacular 24km trail run, which takes runners through the cinder flats and meadows behind Black Tusk. Spots are limited and you’ll have to organize your own transportation to the start and from the finish. Visit The Escape Route and click on the Events tab. As stoke builds for winter IF3 features the newest batch of top ski films with local riders, filmmakers (and partiers) well represented. More details. Originally held by Whistler Blackcomb to clear out last year’s ski gear, this event is now celebrated by most of Whistler’s outdoor stores and many other Village shops. Get big discounts on all kinds gear for all four seasons. Check out the local papers when you get to town for all the sales. It’s also Canadian Thanksgiving so eat some turkey too. 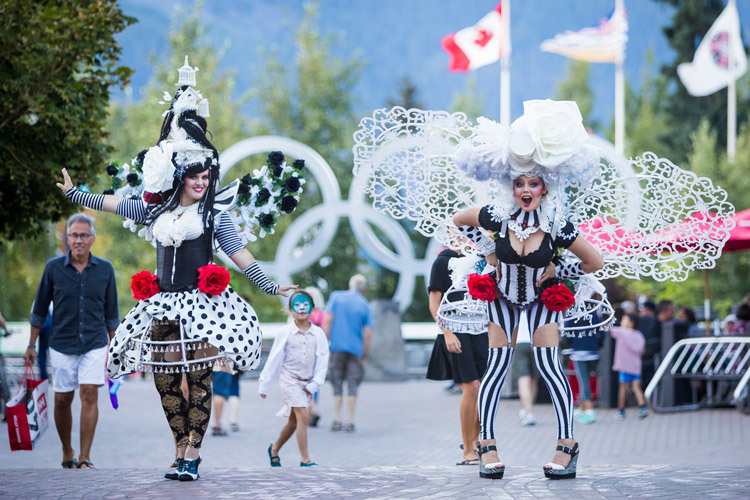 Unshackle your inner Shakespeare at the 14th annual Whistler Writers Festival, a growing event that attracts an incredible lineup of novelists, poets, screenwriters and more. Author Lawrence Hill headlines the 2015 Fest. More info. If you’ve ever wanted to learn more about all of the species of mushrooms and fungus that pop up in Whistler’s forests every fall, this is the event for you. There will be guided nature walks, talks from experts and even a cooking exhibition. More info. If the biggest party night in Whistler is New Year’s Eve, Halloween is a close second and this year it’s a Saturday night. Get your freakiest freak on and join in the fun. Pick up a local newspaper when you arrive, or visit Pique Newsmagazine to get a weekly run-down of events. This annual celebration of food, wine and living the good life gets bigger and better every year. Sample pairings by top chefs and wineries, take workshops, and attend events like the Crush Gala Grand Tasting. In recent years the event has expanded to include health and wellness, as well as sidetracking into beer and cocktails. It’s ten days of living the high life. More details. November 26, 2015 – Opening Day??? The official opening day of operations at Whistler Blackcomb, although early openings are pretty routine on the west coast. Stay tuned to Whistler.com in early November for daily reports and updates. As you can see, the one thing that isn’t on Whistler’s event calendar this fall is boredom – unless that’s what you’re looking for. In that case, Whistler in the autumn months is also a great place to do absolutely nothing and rest up for the upcoming winter. Happy autumn. Plan your Whistler autumn (or winter) holiday at Whistler.com.